The 22-year-old won her first award at the ceremony in the Best New Artist category, and could barely contain her emotions as she thanked her nearest and dearest. Meghan has now revealed it was her dad Gary who triggered her tears, as he uttered a series of words she had been waiting to hear for a number of years. "When they called my name I didn't believe it at all," she told Britain's Fabulous magazine. "Then my dad set me off crying. Throughout my whole career, either as a songwriter or artist, I'd ask him, 'Did I make it yet, Dad?' So we were sitting in the auditorium, they called out: 'Meghan Trainor' and my dad whispered to me: 'You made it'. I just broke down." Meghan previously revealed to the Los Angeles Times she was so overcome she thought she might die because she was so thrilled to have her music acknowledged by the prestigious ceremony. "My heart felt like it was exploding in my chest," she said. "I’ve never had that feeling in my entire life of when you’re too happy. I thought I might die right now. I just fell into my dad’s arms, I couldn't even hug him right, I just collapsed on him." 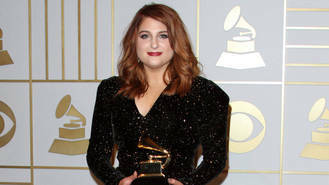 Her father wasn't the only person who was quick to congratulate the star on her first Grammy, as British singer Ed Sheeran was one of the first to commend her. "I was like 'You're Ed Sheeran, and you're talking to me?'" she continued, before revealing how she still isn't used to being famous. "It feels so unreal, as though I'm watching a movie. I have 'pinch me' moments every day: singing with Lionel Richie - I'm like 'Why am I here?' - meeting my idols."